I don’t know how they did it. The House passed a terrible tax bill. The Senate passed one that was almost as bad. To reconcile the two bills a House and Senate Conference Committee was created. I had extremely low expectations. What they came out with was the revised Tax Cuts & Jobs Act (TCJA), and it is, quite frankly, a great bill for almost everyone. As of this writing, it is not a law yet, so no changes have actually been made. It will likely become law before the end of the year, though, but current tax laws will be in place for your 2017 return that you will be working on in a few months. I am not a CPA or tax attorney, so nothing in this article should be construed as tax advice. This article is for informational purposes only. For information about your own taxes you should consult a tax professional. Page numbers refer to the page in the bill where you can find the information. With the increase in the standard deduction, personal exemptions are going away. Under current law you get a personal exemption of $4,050 per individual (which would lower your taxable income). If you choose to itemize, you can still deduct sales, income and property taxes up to $10,000 (page 81). If you choose to itemize you can still deduct mortgage interest for home values up to $750,000 (page 78). Deductions for the interest on a home equity lines of credit, however, will no longer be deductible. Increases the Child Tax Credit to $2,000 per child, with $1,400 of that being refundable for most taxpayers (page 43). College savings plans (529 plans) may now be used for elementary, secondary, homeschool and higher education (page 63). Qualified moving expenses are no longer deductible unless you are part of the Armed Forces (pages 102, 110). Alimony is no longer deductible to the payor (page 100). Eliminates most personal casualty and theft losses from itemized deductions (page 81). Because taxes will be easier to file for many (most will take the standard deduction) you can no longer deduct the cost of paying someone to prepare your taxes (page 99). Simplifies the rules for the Alternative Minimum Tax and essentially doubles the amount you can pass to your heirs income tax-free (Estate or Death Tax). If you have a pass-through business (S corp, LLC, Partnership, or Sole Proprietorship) all gains made in the business currently pass through to your individual tax form where you pay taxes on the gain as though it were income. Under the TCJA you can reduce the amount that flows through by 20% (1). For example, if you have a home-based business and you make $20,000, only $16,000 of that will flow through to your personal taxes. Because of this and other tax-friendly portions of the law, the National Federation of Independent Business, who initially opposed the House and Senate bills, is in full support of the revised bill and is encouraging both Chambers to pass the bill quickly (2). The tax rate for corporations is reduced from 35% to 21%. Currently if you live in your home for 2 out of the last 5 years you can exclude the gain up to $250K (single) or $500K (MFJ). Both the House and Senate planned to increase this to 5 out of the last 8 years. The joint bill contains no provision for this, so it will stay at 2 out of 5 years (page 109). Qualified tuition reduction for graduate students continues to be excluded from income (page 68). Up to $5,250 of employer provided education assistance continues to be excluded from income (page 70). The Adoption Assistance Credit is retained (page 112). Continues to allow taxpayers to deduct student loan interest and tuition and fees, and the American Opportunity Credit is retained. It is important to note that all individual provisions expire after 2025. The plan is that the next President and Congress will extend these provisions for all individuals and families. It is a bit of a gamble, but it is the only way, under current rules, to pass the bill with a simple majority. Scenario 1: Married Filing Jointly (MFJ) with four children; $85,000 in ordinary income. Scenario 2: MFJ with 2 children; $75,000 in ordinary income; $200 in investment income. Scenario 3: Single; $75,000 income; $200 investment income. Scenario 4: Single, $55,000 ordinary income; $20,000 home-business income; $200 investment income. Scenario 5: MFJ with 5 children, $100,000 ordinary income; $20,000 home-business income; $200 investment income. As more information is released I will continue to update this article and post updates on my Facebook page at https://www.facebook.com/RyanHLawBlog/. (1) This provision is eliminated for higher-income individuals and certain service businesses. (3) These calculators get updated as more information becomes available. If you run these same scenarios at a different times you might get slightly different results. If the numbers change dramatically I will update the article. The numbers are correct as on December 17, 2017. 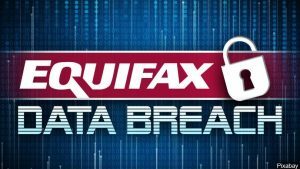 Following the news of the hurricanes, news of the Equifax security breach has been all over the news. Financial data of 143 million Americans has been stolen, and in many cases it means that the victims are at-risk of becoming victims of identity theft for the remainder of their lives. That’s right, you, and if you have them, your children, could be at risk for the rest of your life. The hackers got names, Social Security numbers, birth dates, addresses, credit card numbers, and some driver’s license numbers. Equifax cliams that these executives had no knowledge of the hack when they sold their shares, but I don’t buy it. You’re telling me the CFO didn’t know about this? If he didn’t know, then who did? I’m sure that the timing of the sale will be part of any investigation. The breach has happened, though, and you need to take specific steps to be sure you protect yourself. Let me warn you now, the few hours you spend on this are not going to be the most fun, but it is critical you take care of it now. It will be much, much worse if you wait and are a victim of identity theft. I’ll try to make it as easy as possible for you with links and instructions. First, don’t sign up for the protection that Equifax is offering. It only lasts a year, and, unless you opt-out of it, means you can’t be part of suing Equifax later on. I also don’t trust the company that just had the biggest data breach in history to be able to protect my data. Pass. Due to the severity of the breach, they should offer identity theft protection for life. Sign up for Credit Karma (https://www.creditkarma.com/). You will get free credit scores and free monitoring of your credit reports. If anything unusual happens, they will contact you. It’s a free service and you should sign up for all adult members of your family. Because millions of people are setting these up the systems are not all working. I was able to set up Equifax and Experian, but not TransUnion. I will keep trying throughout the next day or so, and if it doesn’t work I will take care of it via mail.If you need to apply for credit later, you can un-freeze your reports for a limited period of time, after which it will re-freeze. Speaking of children, does it make sense to freeze their reports? The credit bureaus don’t want you to be able to do that, but some states have made it mandatory. All three bureaus are falling in line, but none will allow you to do it online. TransUnion will do a search, for free, to see if your children have credit reports. You can find that here: https://www.transunion.com/credit-disputes/child-identity-theft-inquiry-form. Utah is taking things one step further – they have set up a Child Identity Protection Program through the Attorney General’s office that registers your children’s Social Security numbers as a number belonging to a minor, which will help protect their data. You can find that program here: https://cip.utah.gov/cip/SessionInit.action. If you live in a different state encourage your attorney general to create a similar program. Because I live in Utah and have this option, along with the Zander protection, I don’t feel that I need to freeze their credit, but if I lived outside of Utah I would absolutely take that step. 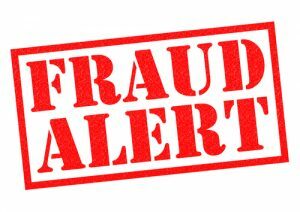 Because credit card numbers were stolen, I recommend calling the toll-free number on the back of each credit card you have and requesting a new number. It’s a pro-active step you can take to prevent unauthorized charges in the future. Again, I realize this isn’t fun – it’s a lot of work to set these things up, but I wouldn’t delay. Take a couple of hours today and get all of this done. Taking these steps is like building a brick wall between you and identity thieves. Are you tired of watching your savings earn .02% per year and seeing your investments lose money each year? You’re not alone. We go through times of high unemployment, low savings rates, negative stock market growth, etc. and we go through times of low unemployment, great stock market growth, etc. It’s all part of a cycle. There are times, of course, when the recessions and troughs last longer than others, but overall that is how the economy works. 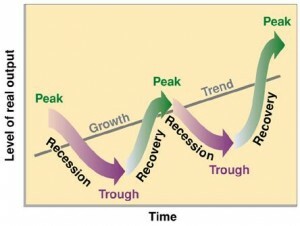 No one knows how long or short any part of the cycle is going to be. The “stock market” is made up of a lot of different components. There are individual company stocks, company and government bonds and money market savings. It also includes things like commodities (gold and silver), oil and real estate. You can invest in all of these. Most people invest in the stock market through their employer (401(k)) or through another retirement account such as an IRA. Typically this is in the form of mutual funds, which is a collection of corporate and government stocks and bonds. Throughout the article when I refer to investing in stocks I am talking about stock mutual funds. Most people shouldn’t be purchasing individual stocks. Past performance in the stock market doesn’t predict what it will do in the future, but it can give you an idea of trends. So how do you make or lose money in the stock market? When the market is down in a recession or trough stocks generally lose money. This can be caused by many things. Most recently the drop in the market has been caused by economic issues in China and the low price of oil, along with a continuing sluggish economy in the U.S. In the first two weeks of 2016 the stock market has lost about 8% of its value. 8% in two weeks! Everyone’s invested assets are taking quite a hit right now. Let’s take a look at some historical data. 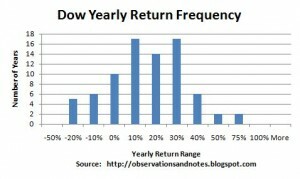 The graph above shows the Dow yearly return frequency. You can see that there are years that the return on your investments would have returned more than 70%, and years it would have lost more than 20%. About 25% of the time the market has lost money. This next graph shows the range of returns for a portfolio of 100% stocks, 100% bonds and 50% stocks and 50% bonds between 1950-2013. In a single year the stock portfolio returned between -37% and +51%. If you go out to 20 years, the range narrows even more to +6% and +18%. The average annualized returns for stocks during those 20-year periods is 11.1%. You have to decide if you are willing to ride out the negative years in hopes of gaining in the good years, and how long your time horizon is. The further out your time horizon is the better chance you have of getting a positive return, with the stock market returning the most. 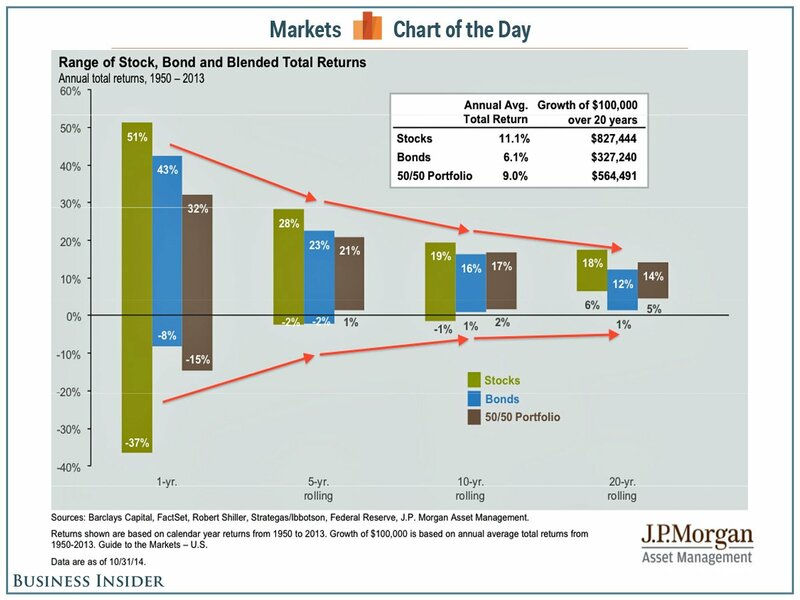 If you don’t have at least 5 years, or even better 10 years, you shouldn’t be invested in stocks. The shorter your time horizon is the more you should be invested in conservative assets such as bonds. That means that you can be invested in stocks the younger you are, and move your money to bonds the closer you get to retirement. A good rule of thumb is that you should take 100 minus your age and that’s how much you should invest in stocks. If you are 40 years old you should invest about 60% in stocks (100 – 40 = 60%). If you are 55 years old you should invest about 45% of your money in stocks. Your risk tolerance level might be higher or lower than that, though. Here is a good free online tool that will help you determine your risk tolerance level: http://njaes.rutgers.edu:8080/money/riskquiz/. Because I have a higher risk tolerance I have more of my assets invested in stock mutual funds. Remember that there are additional ways to invest your money. While most of our retirement money is in the stock market, we are saving up money to invest in some real estate as well. A diversified portfolio is best. 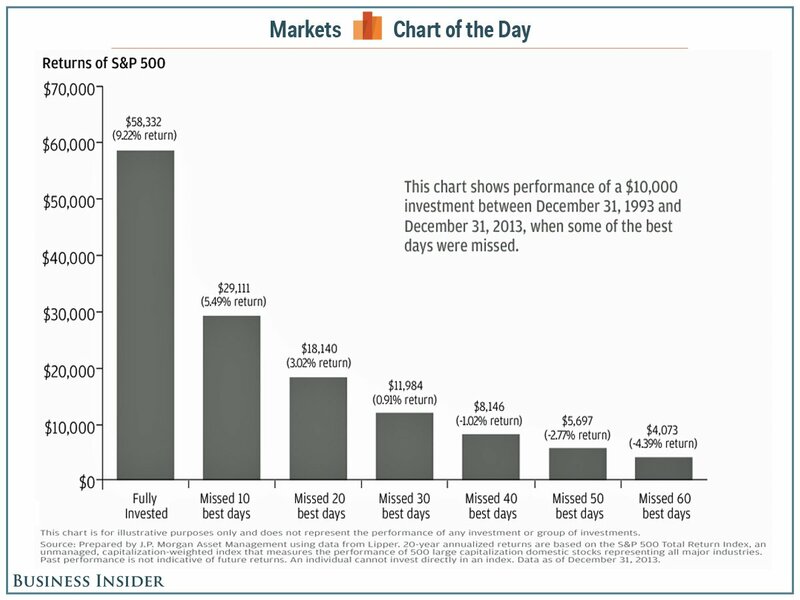 This chart assumes you invested $10,000 between Dec 31, 1993 and Dec 31, 2013. During that time the stock market had some great years and rough years.If you kept it fully invested you would have ended up with just over $58,000. If you missed the 10 best days (which often come right after the worst days) your return drops to $29,000. If you missed the 40 best days your return is actually negative – your $10,000 drops to $8,147. People miss the best days all the time though because they switch from stocks to cash when the market goes down, miss the up-side, and invest when stocks are back at their most expensive. I realize that all these charts and statistics don’t make you say, “Well, I’m sure glad my portfolio is losing money!” No one likes to see their portfolio drop for even a day, let alone for a few years in a row. Every time it feels different, like we aren’t going to recover this time. I understand it. I get it. If you need help, find a financial planner who can help you set goals and stick to the strategy you outline together. Make sure it is someone you trust and has your best interests at heart. Someone who will teach you and encourage you and cheer you on. As always, feel free to leave comments or ask questions below, on Facebook or in an e-mail. There is a lot of controversy, confusion, misunderstanding and unfortunately, even blatant lies in the media about what the Affordable Care Act (ACA or Obamacare) is and how it will affect you, your insurance coverage, and the amount you pay for insurance. Whether you like it or not the ACA is the law and it is important you understand what it is and how it relates to you and your family. After all, your health is one of your most important assets! I won’t go into a lot of detail and I won’t cover all parts of the law – if you want a lot of detail I recommend you visit http://www.healthcare.gov/index.html. My attempt with this article will be to describe, non-politically, what the ACA is in plain English. If you want to hear a partisan description of the law you can tune in to your favorite Liberal or Conservative commentator. Trust me; they have plenty to say about it! The ACA was put together by Jonathan Gruber, an MIT Economist who has studied and analyzed the effects of health-care reform extensively. When Mitt Romney was governor of Massachusetts he called Gruber in to help design a health-care law for Massachusetts, which has become known as Romneycare. As a side note – Romneycare was seen as a “Republican ideal” because it required individuals to take responsibility for having insurance and didn’t give anyone a free-ride. Liberals actually hated the law because they wanted national health care such as the one in Canada. Romney said that this law was his “singular policy achievement” and that it could be applied nationally. Interesting how an election can change things. Romney became Obamacare’s harshest critic, vowing to repeal it if elected and even calling it an “unconscionable abuse of power” by Obama. After studying both laws I’m not sure how anyone can say there is much of a difference, though.. In 2008 Obama called on Gruber to help him design the ACA. Gruber has written extensively about the law. He says it is the opposite of public health care and that insurance companies like the law because they get more customers, especially young, healthy ones that will pay insurance but not need as much healthcare. He says that the most important provision of the ACA is the individual mandate – without requiring people to get insurance it doesn’t work. There will be more on the mandate later. In 2011 Gruber wrote a book titled Health Care Reform: What It Is, Why It’s Necessary, How It Works. This is actually a good book for understanding the ACA, and best of all, it is written in comic-book format. (I think more books should be written this way! After all, a picture is worth 1000 words. Maybe I need to find an illustrator for my blog..) It’s obviously slanted as he is the architect of the law, but it’s worth checking out from your local library. Decrease the number of uninsured Americans. There are currently 44 million uninsured Americans, most of which are either young and they don’t think they need insurance, or they are poor and cannot afford insurance. The ACA should reduce this by 30 million. Pre-existing conditions: Requires insurance companies to cover all applicants of the same age at the same rate, regardless of pre-existing conditions or gender. This provision is something that will be extremely beneficial to millions of people who were denied coverage due to a pre-existing condition. Coverage up to age 26: If you are under the age of 26 you can stay on your parent’s plan, regardless of whether you live at home or on your own, or are single or married. Individual mandate: This is one part of the law that the government was sued over and that went all the way to the Supreme Court. Because the Supreme Court upheld the Constitutionality of the individual mandate it will go into effect in 2014. Essentially it says that if you don’t buy insurance you will be charged a $95 penalty or 1% of income (whichever is greater) in 2014. That amount will increase until it reaches $695 per person or 2.5% of income in 2016. Regardless of your family size you will never pay more than three times the penalty amount if all your family members are without insurance. However, if health care coverage would cost you more than 8% of your income you don’t have to pay the tax. Health Insurance Exchanges: By 2014 each state is required to set up a health insurance exchange (states that don’t set one up will use the national one) where consumers can compare health insurance policies and premiums. Elimination of lifetime coverage caps: In the past health insurance plans typically had a maximum you would be covered for over your lifetime. It was often as low as $1,000,000. With the ACA coverage caps were eliminated. Businesses must offer insurance: Businesses with 50 or more employees must offer health insurance or they will pay a $2000 fine per employee. They don’t have to provide it for employees working less than 30 hours a week. Businesses with less than 25 employees could qualify for a subsidy to offset the costs of insurance. NOTE: Some companies have said they may have to lay off employees or reduce employee’s hours due to this portion of the law, the most famous of which was Papa John’s CEO John Schnatter. Schnatter later said he was taken out of context and plans to comply with the law and that his company is still doing analysis on how it will affect the company. Deductibles and out-of-pocket maximums: Employer plans have a maximum annual deductible of $2000 per person, or $4000 for a family. By 2014 the out-of-pocket maximum per person is $6000 per person per-year (out-of-pocket includes your deductible and co-pays). Preventive Care: There will be no co-pay, co-insurance or deductibles for preventive care. NOTE: This portion is sometimes referred to as the Contraceptive Mandate because under this portion of the law contraceptives and the “morning-after” pill must be free to people with insurance. Some groups, including the Catholic Church, have sued the government over this as they are religiously opposed to contraceptives. Other groups (Hobby Lobby being the largest) have sued the government because they are opposed to providing the morning-after pill to employees. There are currently 28 separate lawsuits about this provision. Under current rulings churches are exempt from providing contraceptives or morning-after pills, but church-run hospitals and schools are not exempt, and they were given until August 1, 2013 to comply. Hobby Lobby and others opposed to offering the morning-after pills were given until January 1, 2013 to comply or they will pay $1.3 million per day in penalties. Hobby Lobby has chosen to stand by its principles and pay the fine rather than offer the pill. Insurance subsidies/tax credits: The Central Budget Office has predicted that insurance premiums may go up 10-13% due to the ACA. To offset this, low-income Americans will not pay anything for health insurance, and many in the middle-class will get some form of tax credits. Individuals making between $14,400 and $43,320 and couples filing taxes jointly making between $29,330 and $88,200 will receive some tax credits. Insurance company profits: Insurance companies must pay out 80-85% of insurance premiums received in medical costs and can use 15-20% for administrative needs and profits. Jonathan Gruber claims that by his analysis the ACA should reduce the federal deficit by $143 billion by 2019 and by $1 trillion within 20 years. 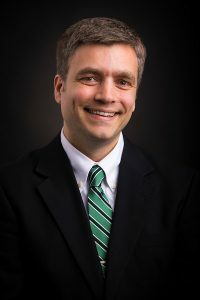 NOTE: Niall Ferguson in the August 19, 2012 Newsweek cover article claimed that the CBO (Central Budget Office) and Joint Committee on Taxation have said net federal spending will be $1.2 trillion by 2022 even after all taxes and penalties have been collected. However, the CBO has actually said that it will decrease the deficit by more than they originally thought. I believe the jury is still out on this one – in 2022 we will know for sure, but I struggle to see how it will actually reduce the deficit. I hope I am wrong, though! .9% tax on incomes over $200,000 (individual) or $250,000 (family). 3.8% tax on unearned income over $200,000 (individual) or $250,000 (family). Insurance providers will pay an annual fee. Pharmaceutical companies and other companies that manufacture medical devices will pay taxes and fees. The 7.5% AGI floor for itemized deductions is being raised to 10% (You can deduct your medical expenses if they exceed 7.5% of your Adjusted Gross Income and itemize deductions – that is being changed to more than 10% of your Adjusted Gross Income). I hope this article has helped you understand the law better and how it will affect your family and your insurance. I believe there are both good and bad portions of the law and I’m sure we will see more lawsuits and attempts to change portions of the law through legislation. As major changes come about I will continue to post them on my blog. Among other similarities, Romneycare requires individuals to have insurance (individual mandate), gives free health insurance to the poorest citizens, penalizes employers not offering insurance and sets up a health care exchange. The only real difference is that Romneycare is administered on a state level and Obamacare on a national level. With President Obama’s re-election a number of news articles are saying one of his first challenges is to deal with the upcoming “fiscal cliff”. Today’s article will attempt to explain what that means in simple terms and what it can mean in your life. The “Fiscal Cliff” will begin on January 1, 2013 and means $7 trillion in tax increases and spending cuts over the next ten years. On the front-end that may not sound like a bad thing, but it could be crippling to the economy the way it is set up. Non-defense – a similar amount would be cut each year from non-defense spending. Some programs, like Medicaid, Social Security, civil and military employee pay and veterans benefits, are protected, but everything else, including education and air traffic safety, will be affected. Marginal tax rates will increase – they will go from current levels of 10, 15, 28, 33 and 35% to 15, 28, 31, 36 and 39.6%, respectively. 1. 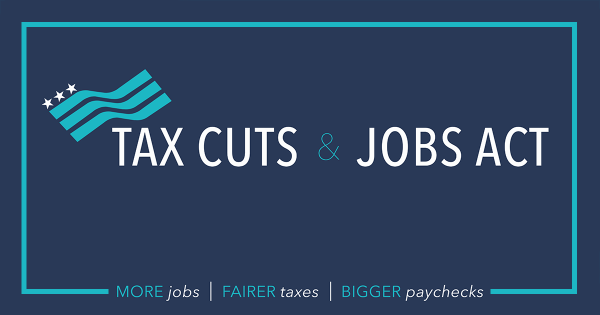 If all tax cuts stay where they are and no cuts are made in federal spending we will continue to face a mounting deficit of $1 trillion per year, which is unsustainable. 2. 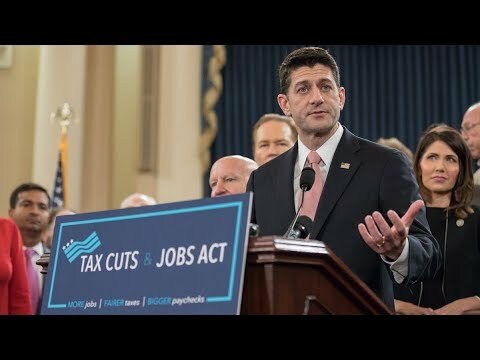 If all the cuts go into effect the economy could be thrown back into a recession (cuts often mean job elimination or pay cuts and those with jobs will pay higher taxes). Neither option is a good one – obviously Congress and the President need to work together to figure out the best path. Both parties have expressed that they plan to work together to come up with a solution. While the country faces difficult economic challenges and has a long road ahead to get on solid financial ground, you can take steps to stabilize your own financial situation. As we always preach, learn to live on a budget, get out of debt and set up an emergency fund. These three steps can lead to financial peace of mind.